Written by: Ron Crognale on November 24, 2014. Cargill is one of CAF America’s partners in global philanthropy, working to address the complex challenge of feeding the world while at the same time protecting the planet. This story is featured in recognition with Cargill’s participation in #GivingTuesday held on December 2, 2014. Read more about #GivingTuesday here. It’s a viciously simple conundrum: How can smallholder farmers raise their productivity and, by extension, their incomes, when they don’t have the financing and training needed to grow a solid crop in the first place? If they are able to get a few good crops in the bin, they could reinvest to improve their production. But how do they find the wherewithal to take that first step forward? This conundrum is on vivid display in rural parts of Mexico’s southeastern state of Yucatán, where poverty is extreme and farmers of white maize have very low rates of productivity (as low as 1 ton per hectare, compared with rates about three times that for grain farmers across Mexico and as much as six or seven times that in countries like the U.S., according to the World Bank). White maize is one of the most important traditional crops in the country. Used to make tortillas, it is a cornerstone of the Mexican diet. But before many of these farmers can provide this staple crop to their communities, they need help jumpstarting their production. “The farm beats you when you don’t have the proper resources to farm, not even the resources to fight weeds,” said Don Cecilio Catzin Yupit, a white-maize farmer in Yucatán’s Tigre Grande community. 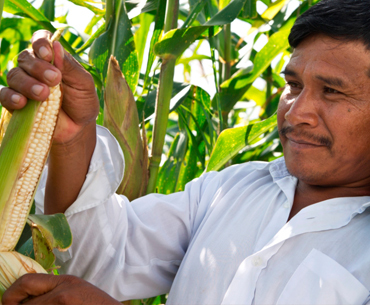 It’s to help farmers like Cecilio that Cargill worked to sponsor and organize the Cargill Educampo Mayab program in conjunction with the Mexican Foundation for Rural Development. During a five-year period, the program is aiding Cecilio and up to 300 fellow farmers by providing access to agricultural supplies like fertilizer and technology like seeds and harvesting equipment, tailored to local needs. It also offers hands-on technical assistance and training throughout the crop production cycle, as well as financing. But Cargill Educampo Mayab doesn’t just stop with agricultural work on the farm. Farming is a business, so the program works with farmers to help them understand how to better commercialize their crops, manage costs, and undertake other financial and administrative planning. It also works to assist the farmers in creating self-managed coop organizations where they are able to identify common needs, share resources and create economies of scale. In other words, it is helping them become sustainable entrepreneurs and raise their overall quality of life. “As the program advances, [the farmers] see the benefits they can obtain. To a large extent, this is through the organization of the groups of work,” said German Galera, technical promoter for Educampo Mayab. The project lines up with Cargill Mexico’s goal to source a larger supply of white corn in a sustainable and responsible way. “Amid the ever-growing concern about food security worldwide, we believe Mexico has the capability to substantially increase food production, both for domestic consumption and as a contributor to feeding the world,” said Valeria Olson, Cargill’s director of corporate affairs in Mexico. So far, Cargill has donated $700,000 to funding the initiative. The program launched with the spring crop of 2013, and across the first two years, white maize farmers saw their yields more than double on average. A smaller group of soybean farmers saw a yield rise of about 18 percent. To date, the farmers have organized 23 coop groups. “It’s something we couldn’t have accomplished before, because we didn’t have any resources. There is really nothing more to say other than thank you a thousand times,” said Cecilio. Cargill provides food, agriculture, financial and industrial products and services to the world. Together with farmers, customers, governments and communities, we help people thrive by applying our insights and nearly 150 years of experience. We have 142,000 employees in 67 countries who are committed to feeding the world in a responsible way, reducing environmental impact and improving the communities where we live and work. For more information, visit Cargill.com and the News Center. As a company dedicated to being the global leader in nourishing people, Cargill is working to address the complex challenge of feeding the world while at the same time protecting the planet. Cargill advocates for policies that let markets work and enable farmers to thrive; helps expand access to food, improves nutrition and pursues partnerships to end hunger; and works to increase agricultural productivity and incomes while ensuring responsible use of natural resources. Over the past five years, Cargill has contributed more than $81 million to reduce hunger and improve nutrition globally.